Held every four years, the International Violin Competition of Indianapolis focuses on offering participants the chance to perform before large audiences and to measure their musical progress against the standards of a distinguished jury and the artistry of other talented players. 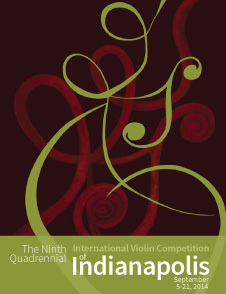 Regarded as the Western Hemisphere’s “Olympics of the Violin”, Indianapolis has hosted eight competitions. The event programs contain greetings from various Indianapolis and IVCI leaders, maps, a competition schedule, the artistic structure of the event, lists of participants, repertoire, and prizes, details on special projects, a listing of the administration and volunteers, a note about the juried exhibition of student art, and a listing of the funding and support from individual, corporate, foundation, and government contributors. Published consecutively by IBJ Media in 2006, 2010, and 2014.